Thanbyuzayat War Cemetery, Plot A8, Row D, Grave 13, Age 24. Soldier was wounded in action at Buona Vista on 15.2.1942 and was admitted to 2/13th Australian General Hospital with a gunshot wound to his back. Discharged to unit on 20.2.1942. Evacuated to Khonkan 55km Hospital Camp on 4.7.1943. His left leg was amputated below the knee as a result of tropical ulcers. The leg was re-amputated above the knee. 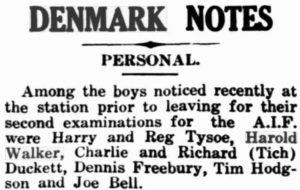 ‘Tim’ Hodgson’s parents and 2 older brothers were (possibly residing) in Germany at the outbreak of WW1. His mother and brothers managed to leave and return to England. His father John Henry Hodgson was imprisoned in a civilian camp near Berlin throughout the war.